In my continuing exploration of the ocean through the medium of oil paint, I’m reflecting on all the roads I’ve traveled, and the ocean that I always find my way to at the end of them. In the past seven years, I’ve lived with forty people in ten different locations. I’ve worked as a barista in fifteen different coffee shops, and as a graphic designer for three different companies. 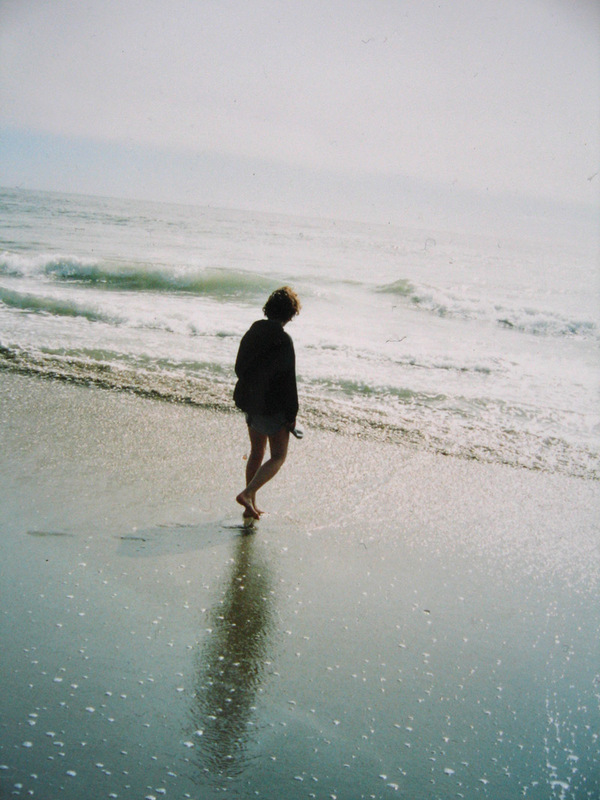 With all this chaos and flux, the eternal, unchanging nature of the ocean has always lured me and felt like my home. Again and again, its waves emerge as my expression whether I’m painting in a friend’s basement, barefoot on the porch of another rented house, after-hours in the storefront of a frame shop, or crammed into a 5’x5’ school studio. In this way, these paintings are a translation of the ocean through the eyes of someone who lives far from it. They are full of the longing one feels for an old lover who has become more precious because of their absence. In these paintings I can really see Alisha’s personal style developing. 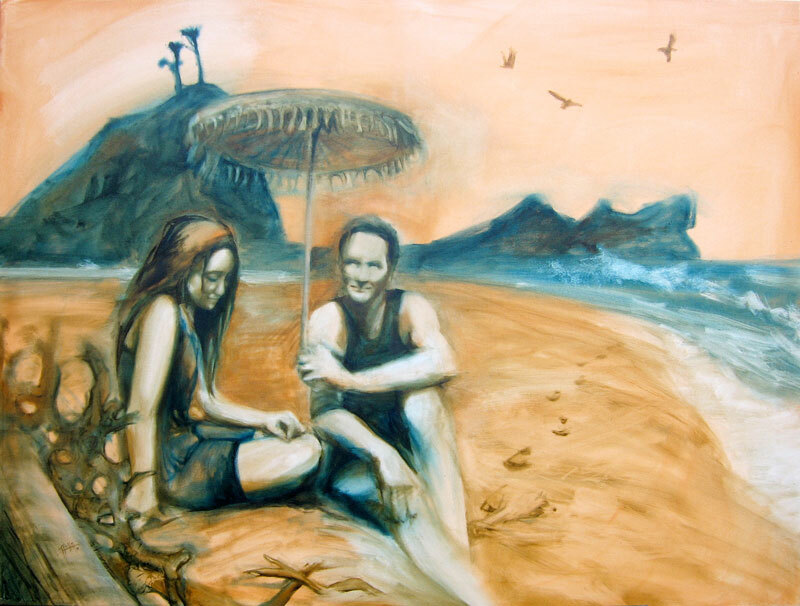 In We Were there’s a very particular liquidity to the outline of the woman’s hair, and some of the beach debris, a kind of Kodachrome-in-oils effect. The Girls‘ background–winter trees, men in heavy coats–is at odds with the girls-on-a-summer-beach feel of the foreground, and despite the colour it retains the look and feel of a faded black and white holiday print, though oddly disturbing, because of that background. As I become more attentive to the details in what I choose to paint, I’m realizing it’s the little things that are important in giving the piece it’s character. In my portraits, one brush-stroke can make all the difference to an expression. Equally, capturing a likeness in body language is as important as the face. Also, something that has been emphasized in my classes at the UW is figure-ground relationships– paying as much attention to the environment and context as the figure. I’m really exploring these ideas in both these paintings. “We Were” is an image composed of a snapshot from the 40’s I found at an antique shop, along with photos I took at La Push in ’07. I wanted to give precedence to body language in how the figures are relating to each other, and echo that relationship in the trees on the rock in the background. “The Girls” is inspired by another black & white snapshot I had found. 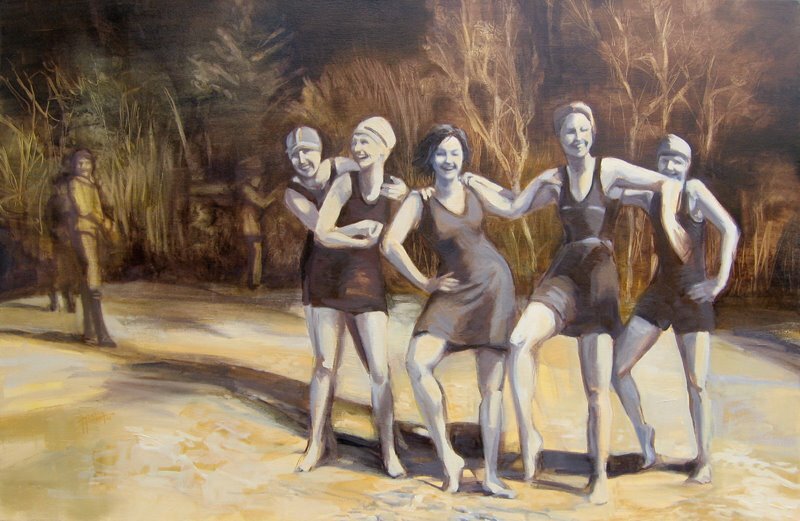 I had painted it before back in 2005, but then had only included the girls with a flat yellow background. This time, I wanted to go bigger–zoom out– and tell more of the story. In doing so, I became more aware of the incongruency between the summertime feel of the girls and the wintertime landscape behind them. Because of this, the moment of these girls/women laughing away in their swimsuits becomes a bigger act of spontaneity and frivolity. I should mention that these are the only figurative works in this particular show. The other paintings I consider to be ocean portraits–focusing on its colors and emotive qualities. I guess you could say it’s my attempt to capture the ocean’s body language! So there you have it: the reason Alisha’s work speaks to me. It’s all about landscape and body language. If you happen to be in Fremont on Friday, for the artwalk, do drop into Fremont Jewelry Design, and then stroll along to Oohla’s, just down the street, where she has more paintings hanging for your delectation and delight. If I understand it right, we came from the ocean. No wonder it seems like home. Good luck with your art show, Alisha.